Oprah Winfrey guides you into her office and, after a welcoming hug (Winfrey’s a hugger, but you probably already knew that), she immediately anticipates where your eye is going to land first. 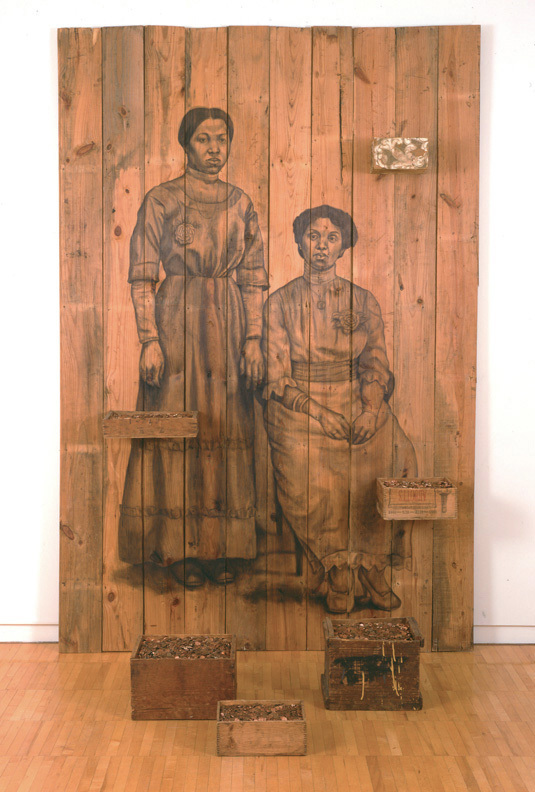 Over in the corner, overlooking her Oprah Winfrey Network studio lot, there’s artist Whitfield Lovell’s “Having,” a charcoal on wood panel image of two African American women that has three wood boxes of pennies placed in front of it. The spacious West Hollywood office contains scores of Emmys (not all of them), shelves and shelves of books, many dotted with framed photos of Winfrey with the likes of Barack Obama and Nelson Mandela. Everything here has a story, and Winfrey, a consummate teller of tales, her own and others’, will happily share them with gusto. “You see that photograph of me and Madiba over there?” Winfrey says, pointing to a picture of her and Mandela, telling of the time she went to South Africa to help AIDS-stricken children for a project called Christmas Kindness. Once there, Winfrey, her hair braided, waited with a town mayor for Mandela to arrive via helicopter. The town mayor’s lesson: Rise for the moment. Give people the Oprah they know. Over a long, discursive conversation, Winfrey, 63, did just that, touching on the movie she just made for HBO, “The Immortal Life of Henrietta Lacks,” in which she plays Deborah, the daughter of the title character, an African American woman whose cancer cells became crucial to medical research. We also talked about her next movie, “A Wrinkle in Time,” made with her friend, Ava DuVernay, who created the beautiful, character-driven drama “Queen Sugar” for OWN. And other movies too, ones that Winfrey has made, might one day make, as well as films dear to heart. Deborah is searching for her identity through finding out about her mother. Did playing her make you think about your half sister, Patricia, and what it was like for her to find you and your mother after so many years? You’re the only person who’s ever brought that up! But you are right. I thought of her a lot. There’s a line where Deborah says, “The only thing I care about is my mother and my sister.” I know that my sister has said those words. Her longing for family informed your work? Definitely. That was part of my process. Because I don’t have that longing. I’m the exact opposite. Like, probably when I was 20-something, I was told by a cousin that my father wasn’t my father. And I said, “The only father I have is Vernon Winfrey and he’s in a barber shop in Nashville, Tenn.” And if somebody who said they were my father came to my front door, it would not matter to me. I’m glad my father did lay claim to me when he didn’t have to. And I’m glad my mother didn’t abort me because it would have been easier to do as a poor colored woman with no education in Mississippi. So I’m grateful for that but I don’t feel this deep sense of belonging to them. I think I belong to something bigger. The coming of me has been in the making for a long time. I don’t feel this deep sense of belonging to them. I think I belong to something bigger. The coming of me has been in the making for a long time. I never read it thoroughly when it was done, but I just recently looked at Henry Louis Gates’ book, “Finding Oprah’s Roots.” Looking at it, I am a descendant of not just slaves, but slaves who loved land, which I now have a thing about land. I like it better than shoes. I’d rather have a nice piece of land than a great pair of shoes! The fact that my great-great-grandfather could come out of slavery and end up a land owner, my great-great-grandmother would come out of slavery and end up a teacher and built a little school on a property … and I had this yearning to build a school for girls. That’s what I mean: It all comes from something bigger. Deeper. Going back to Deborah and the movie … if you made that connection with your half sister, why did you have so many reservations about taking the part? I always have reservations about acting. I don’t want to embarrass myself. I started with Spielberg. So I started pretty high in the food chain. I was terrified. There was another movie — was it “Mask”? — where somebody had recently been fired, and it had never occurred to me that you could be fired from a movie. But I did know that if there was anybody who could be fired, it would be me, because I didn’t know what I was doing. Period. My first day on set and I am in the first scene and I walk in and look directly into the camera and say my line. “Cut! Cut!” Steven asked, “Why are looking into the camera?” I had been on TV since I was 19 and that’s what you do. You look at the camera. Anyway, I learned. But I’ve never stopped being intimidated. What about acting for Ava in “A Wrinkle in Time”? Well, that was different. That was just a fun thing to do. I’m so proud of her. You know why? Because it mirrors my relationship with Maya Angelou. She used to tell me she was proud of me, but I couldn’t hear it. I couldn’t receive it. I didn’t really know what that meant until my friendship with Ava. Every time she does something, I think, “Oh. This is what Maya felt about me. That’s what it means when you feel enlarged by someone else’s successes.” Her growth makes me feel broader. So I did. And I believe I am Mrs. Which! You know, she’s born of the stars and she’s a wise woman coming from another cosmos. So, c’mon! And she loves pontificating. For the Record, June 15, 4:05 p.m.: An earlier version of this article misspelled Oprah Winfrey’s “A Wrinkle in Time” character’s name as Mrs. Witch. Next thing you’re going to say is that she loves desserts and Toni Morrison. She probably does! Anyway, it was done out of friendship in the beginning and turned into a great experience. I just saw it in its rough stages the other day, just a piece of it, and I started to cry. She’s put her soul into it. And Disney has given her the luxury of time, which she has never had before. It’s going to pay off in ways you can’t imagine. [In an email, DuVernay writes: “This is my second time working with Oprah as an actress. The first was with her poignant portrayal of the real-life civil rights legend Annie Lee Cooper in ‘Selma.’ This time around we worked together on her portrayal of an all-knowing, all-wise celestial being who brings good and light to the Universe. Tall order for most. But she dazzled me and everyone on set with the ease and effortlessness of her performance. It’s saying a lot when you can make all-knowing and all-wise look easy! But she did just that. What about this talk of you playing the Shirley MacLaine role in Lee Daniels’ remake of “Terms of Endearment”? Is that going to happen? It’s just a rumor. I spoke to Lee actually this morning who told me that somebody is writing it. And I go, “Lee, you’re not doing a thing until you have a script.” And I don’t think it should be called “Terms of Endearment,” that’s for sure, especially if you’re doing a whole other script. It’s about an African American family and the girl gets AIDS from the husband. That’s not “Terms of Endearment.” It’s something else. So you’re not stepping into Shirley MacLaine’s shoes? What I am saying for sure is that I am not going to try to step into Shirley MacLaine’s shoes. It’s unnecessary to do that. She’s already done it as well as it could be done for that role. I just watched “Terms of Endearment” recently with my girls [students at the Oprah Winfrey Leadership Academy for Girls in South Africa]. I sit down with them, telling them all the movies you need to know. (She pounds her hands) Movies you … need … to … know. “Terms” might be my favorite movie of all time other than … well, “[One Flew Over the] Cuckoo’s Nest” is one of my favorites. When I first opened my school, I made everyone watch “The Wizard of Oz,” and they were like, “Mom O, why are we watching this white girl run up some yellow bricks?” That’s when they were 12 or 13. Now they get it. Because I teach, “You’ve always had the power. You spend your whole life running around, looking for the perfect yellow brick road and it’s always right here.” Now they’re college graduates. We were just talking about this the other day. “Remember when you made us watch ‘The Wizard of Oz?’ ” What was that all about? What’s your favorite line in that movie? Come on. Tell me! “Stand up. Your father’s passing.” Still gets me every time! I normally don’t watch movies more than once. That one I probably saw three or four times as a little girl. Scout. Why didn’t someone name me Scout? I just love the idea of being a Scout. You can never be mad at a Scout, you know.